After yesterday's directionless trading action, the precious metal regained positive traction on Tuesday and remained supported by reviving safe-haven demand to print fresh multi-months tops at $1306.34 per ounce amid fresh concerns over a further escalation in the US-China trade tensions. The US Justice Department charged China's Huawei Technologies with fraud and obstruction, which was now seen to complicate the upcoming high-level US-China trade talks and dented investors' risk appetite. On the other hand, the dovish Fed expectations continued weighing on the greenback providing huge support for the yellow metal. 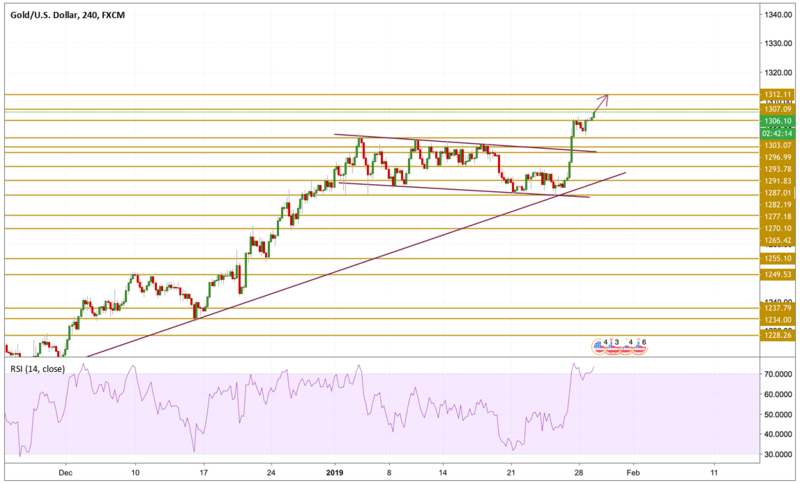 As expected, Gold prices continued the upward movement after breaking from a long term consolidation on Friday. Prices printed new highs during today's opening hours to climb above the $1305 level and march towards our target which is the $1307.09 level. Despite being in extreme overbought state, we will be focusing next on the $1312.10 level before we consider a technical correction.